For the serious backyard cook, a professional appearing outdoor kitchen is the ultimate dream. Fortunately, there is an option that doesn't require you to know anything about plumbing, masonry or basic construction. Prefabricated grill islands come in all sizes and can offer a whole host of amenities. While these units can be very expensive, they are becoming more and more popular. Grill islands are a great way to add value to your home and replace a rickety old gas grill with something that really impresses. A grill island is a large, stationary structure that has space for a gas grill, plenty of counter space and can include practically anything you would have in your indoor kitchen. These days cabinets, refrigerators​, and even dishwashers are designed for outdoor use and can easily be built into a grill island. If you have a need for something it can be added on. The advantage of these pre-made units is that they can be delivered, hooked up and ready to go in as little as a day. The grill island owes its origin to the TV show, "Dallas". The producers of the show felt that this fictional Texas family would of course "barbecue" and they would do it on a gas grill that reflected their wealth. The Ducane Company was asked to come up with something and what they built was a dual grill with lots of counter space. You can actually buy this grill today. From this fictional grill was born an industry and now several companies make these units. Grill islands are almost completely customizable. You choose the enclosure you want and then pick out the charcoal or gas grill and whatever other appliances and amenities you might want. Once ordered, your grill island will be delivered right to your home and if they have to they will bring a crane to get it into place. You'll need to have the water, electric and gas lines to plug it in. Of course, you will need to save your money; grill islands can run well over $10,000 for the most elaborate models. When looking for a grill island remember that the easiest solution may not be the best. Most of the big box retailers now have island options. These tend to be inexpensive largely because the construction is cheap. When shopping for an island you need to be aware of the materials it is made out of. Practically anyone can put together a wood frame, slap some tile on it and call it a grill island. If the island you are looking for has stainless steel parts, test the stainless steel with a magnet. If it sticks leave it. If it falls off to consider it. There are a lot of materials out there these days that can stand up to practically anything. If your island has exposed wood it will need to be regularly treated. If it has metal, it will need to be protected. Take a look at some of the new plastic materials being used. We know this sounds cheap, but recent developments in plastics have created materials that can withstand a great deal of heat, won't fade or degrade in the sun and can take extreme cold without cracking. These islands are also lighter weight so that can be easily moved if you need to. Take a look at A & B Accessories to see what I'm talking about. This material looks like real wood but requires very little care to keep it looking great for years. The real secret with prefabricated BBQ Islands is modularity. 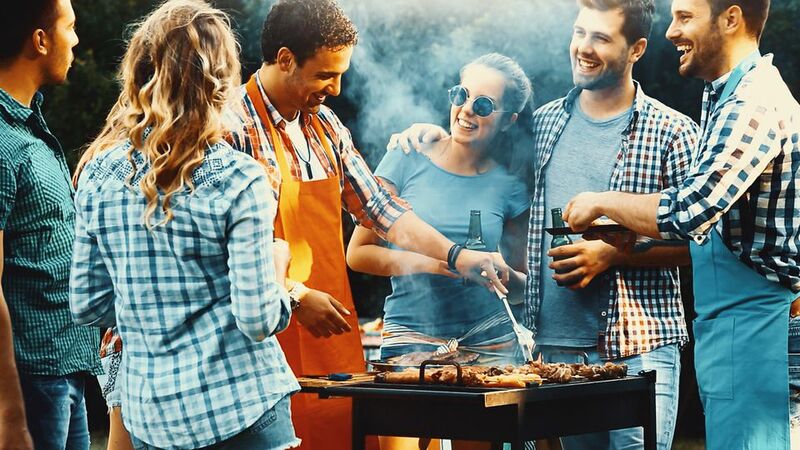 Having the ability to replace appliances (like the grill itself) without having to throw it all out makes the most of your investment and allows you future versatility.